This is a delightful book to help children manage their feelings of fear and anxiety. The illustrations are whimsical and allow for further discussions beyond the text. The purple elephants and blue monkeys get up to lots of mischief in Sophie’s bedroom. These silly animals will get children excited about using action words to describe what the animals are doing, like reading, playing, swinging and more! Don’t skip past the end pages, showing some purple elephants, a blue monkey, as well as a red and yellow giraffe. This can be used as an opportunity for children to make inferences using the pictures as support: what animal might Sophie think about (or rather, not think about) tomorrow night? 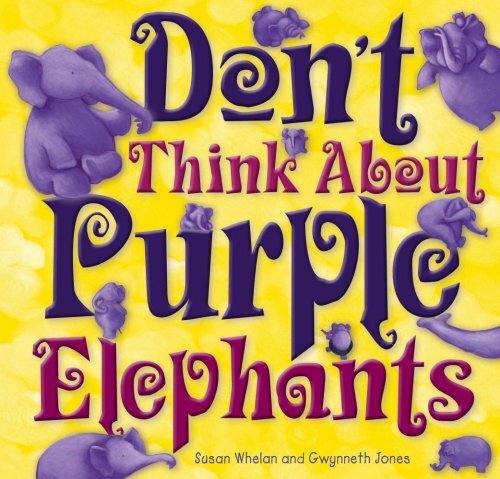 Don’t Think About Purple Elephants is also a great choice for working on a range of grammatical goals. It can be used to model the pronouns ‘she’ and ‘her’ as these words are repeated many times throughout the book. This book can also be used to work on regular plurals - on some pages, there is only one elephant and on other pages, there are lots of elephants. For further speech and language targets in Don’t Think About Purple Elephants, see the list below.